~~Elwyn Brooks White, (July 11, 1899 – October 1, 1985), also known as E. B. White, American writer, contributor to The New Yorker magazine, co-author of the English language style guide, The Elements of Style, ("Strunk & White"). He also wrote books for children, including Charlotte's Web and Stuart Little. Quote taken from The Points Of My Compass. Google has integrated two themes with a colorful, interactive doodle that celebrates Valentines Day and honors engineer George Ferris, inventor of the Ferris Wheel. 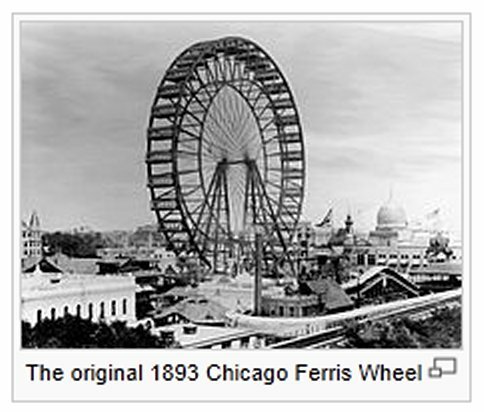 Happy Valentines Day and Happy 154th birthday to George Ferris born on February 14, 1859 (d. November 22, 1896), engineer most famous for inventing the original Ferris Wheel for the 1893 Chicago World’s Columbian Exposition. 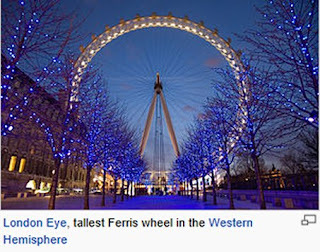 The doodle (see video above) features two Ferris Wheels surrounded by a midnight blue sky and surprise animal pairings. Pressing the heart button spins the Ferris Wheels and displays surprise images of paired animals -- elephant & monkey, turtle & rabbit, horse & tiger, frog & dolphin, octopus & bear, octopus & duck, hippopatomus & bird, etc. -- all having heart-to-heart moments and out on the town. 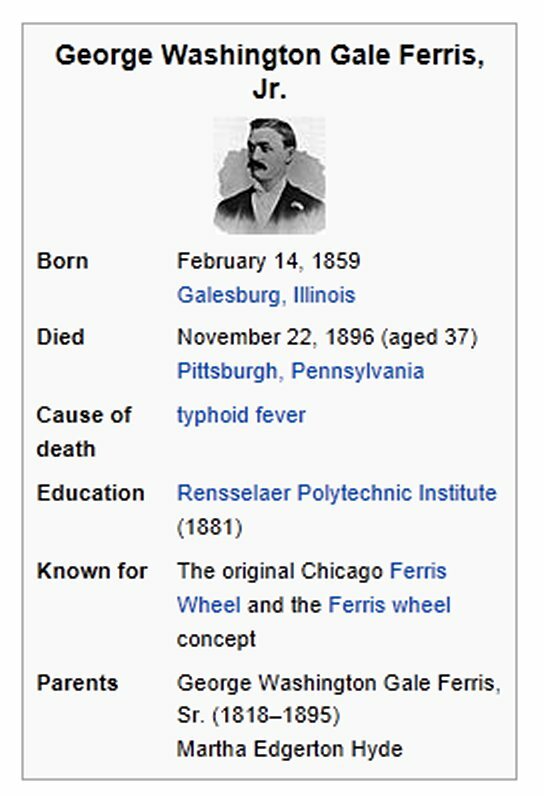 Born George Washington Gale Ferris, Jr. Ferris was born on February 14, 1859, in Galesburg, Illinois, the town founded by his namesake, George Washington Gale. His parents were George Washington Gale Ferris Sr. and Martha Edgerton Hyde. In 1873 George entered the California Military Academy in Oakland, graduating in 1876. That fall he enrolled at Rensselaer Polytechnic Institute in Troy, New York. There he studied civil engineering and engaged in extracurricular activities, including the football, baseball, and rifle teams and the Glee Club. Although required to be reexamined in some courses before passing, he received his engineering degree in February 1881, with a senior thesis titled, "Review of Wrought Iron Deck Bridge on the Boston Hoosac Tunnel & Western Railway at Schaghticoke, N.Y."
Ferris began his career in the railroad industry and was interested in bridge building. 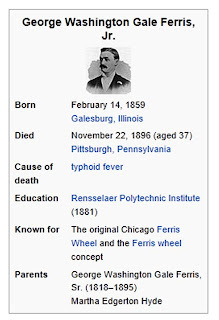 He died a few months after his father passed, at 37 years old from typhoid fever. All photos courtesy Wikimedia. Any other photos will be credited as required. Yes, I agree. Thank you so much for your feedback.